Another Sneak Peek at Our New Tacoma Location! 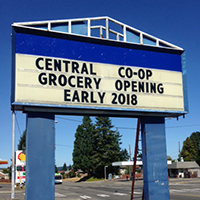 Our cooperative grocery store is coming to North Pearl Street! Building renovations are now underway, and we plan to be open for business in early 2018. After the success of our first Sneak Peek event in August, we are excited to give people another preview of what is to come! Please join us in our new parking lot where we will have plans for the layout of the new store, information about jobs and membership at Central Co-op, refreshments, and - if worksite conditions allow- an opportunity to see into the store while it's under construction.